We're pleased to welcome Charlotte Nash to CLC this week, as her latest novel, The Paris Wedding, published in the US this week! Thanks to HarperCollins, we have THREE books to give away! Charlotte Nash was born in historic Lincoln, England and grew up in the sunny Redland Shire of Brisbane. Obsessed with horses and riding, she began stealing her mother’s Jilly Cooper novels at the age of thirteen, and has been enthusiastic for romance ever since. Always a little unconventional, she took a meandering path to writing through careers in engineering and medicine, including stints building rockets and as an industrial accident investigator. Now she writes romantic stories, and moonlights as a creative writing PhD student, studying how narratives engage the brain. She lives in a cozy Brisbane cottage with her husband and son, and a small flock of lovable chooks. Visit Charlotte at her website and on Facebook and Twitter. It’s been ages since Rachael West has seen the man she once believed she couldn’t live without. Receiving his wedding invitation was bittersweet—she was oddly touched he’s asked her, but knows that facing him on this day would be the hardest thing she’s ever done. But her friends and family convince her to attend. After all, it’s an all-expenses-paid trip to Paris! Surely she can get through that one day, and discover all the delights of that magical city the remainder of the time. Oh, so many. Jilly Cooper, because she was my first introduction to this type of genre, and wrote such big, bolshy, fun characters who had struggles that seemed so lifelike. Diana Gabaldon, because, you know, Jamie Fraser in a kilt (and jokes aside, the incredible freshness of Cross-stitch (now Outlander) when it first came out). More recently, Liane Moriarty, because she has such a keen ability to observe her characters and use just the right words, and JoJo Moyes for the same reason, and because I think she captures a truth about people that's hard to do. What is something unique about your writing style? 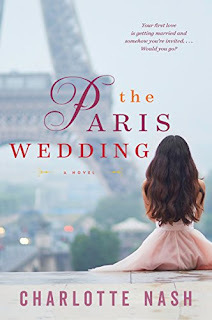 If The Paris Wedding were made into a movie, who would you cast in the lead roles? Rachael West (our heroine) needs that wholesome, naïve quality, but also the capacity for great sacrifice and transformation. I'd be keen for Katherine Langford (from 13 Reasons Why) – she looks like she could convince us she came from a farm, but hold her own in a fashionable crowd. Sammy (her best friend) is more street-smart, but an incurable romantic. A strong, supportive type but who tends to hold her own problems very close to her chest. I like Haley Lu Richardson or someone like her, even though she's younger than Sammy. Matthew Grant (the man Rachael never got over) is an up-and-coming star physician, but straddling the uncomfortable territory between his roots and his new world. Someone like an older version of Tom Holland, who has that boyish quality but can still carry authority. Or Callum Turner, who's about the right age, look, and presence. Antonio Ferranti (the dashing Italian-American photojournalist) needs an older actor with a rugged quality. Perhaps Justin Baldoni – his Ted talk about redefining masculinity showed such a great capacity for comfort with himself, but a critical eye for how the world is. Perfect for Antonio. Where is your favorite place to spend money? At my local café mostly! However, about once a year I go on a 'spree' of buying vintage fashion online (mostly eBay). I know which designers I like and my sizes and I go a little crazy buying too many boots and coats. I comfort myself that it's recycling (as well as a bargain). What is your favorite thing to do at an amusement park or carnival? Eat dagwood dogs. I think in America that's called a corn dog? (hot dog sausage on a stick covered with batter and deep fried). I'm a sucker for the food carts. At the cinema: Avengers: Infinity War. It's so surprising. On my home screen … I'll admit that I re-watch The Devil Wears Prada and Midnight in Paris over and over. They are so brilliantly structured and entertaining and funny, and yet have deeper things to say. I never tire of them. I'll stop there, otherwise I'll be recommending a whole shopping list! Giveaway ends June 19th at midnight EST. My mother got married last fall and my husband and I were in the wedding. My husband walked my mom down the aisle. She had a friend officiating the ceremony and the lady was nervous she forgot to ask "who gives this woman away" and just started with the vows while my husband was still standing there. Neither really knew what to do until a few minutes passed. I think my mom spoke up about it before it went any further. Nerves in wedding ceremonies are such a classic. Hope the day went well otherwise! The weddings we've gone to haven't been that unique as to make them memorable. However, we went to our friend's son's wedding two years ago and he tripped going down the stairs. Thankfully, he caught himself before he actually hit the floor but we all gasped. That was also the wedding where the speeches made by the wedding party were the funniest and best I've probably ever heard. Oftentimes the speeches are inside jokes which cause great laughter from the story teller but no one else in the audience knows what they're talking about. I attended a co-worker's wedding where the maid of honor broke her leg the day before. the groom was dancing at the wedding and twisted his knee and a hurricane took out the resort where they were to honeymoon. I won't mention the car troubles subsequent to the re-done honeymoon.... They were just relieved to get back to work in one piece, such as it was. Hi Charlotte, thankfully, the rest of the wedding went as planned. Attended an Indian wedding - the saris were beautiful! We now are married with 2 fabulous kids and are so thankful we lived and grew and matured in our 20s without each other so we knew at 28 we were ready to be together forever. I would never have believed that would be my path to love but I won't change a thing! I guess I had to date a few frogs to truly appreciate my prince! I loved my wedding. It was one that my husband states he was thrilled that he knew most of the people. It was on a warmish day in November in the Mid-West and it was sunny and the reception was overlooking the lake. It is almost 20 yrs later and I still find it my favorite. Both my son's weddings were beautiful and special. No problems and lovely ceremonies and reception. While my wedding was amazing, the one I remember most due to a “mishap” was the wedding I attended for my roommate from college… or, technically, didn’t attend. She is from a small island off the coast of Maine, and my now-husband and I thought we were making good time to be able to get to the ferry out to the island. We got to the ferry, only to watch it depart from the dock. We were able to make it to the reception, but missed the ceremony. Luckily, I can't remember a mishap! I attended the wedding of my friend's son last year and it turnrd out beautifully. If there were any mishaps they weren't noticeable . Every wedding I've attended has been lovely. The most memorable wedding I've been to was my own. Short, simple and sincere. My most memorable wedding was my own 41 years ago. Our daughter's wedding was also very special. The man I am with now is an old boyfriend from 30 years ago. I have never been reunited with an old love. A memorable wedding for me was to travel to Scotland from New Zealand to attend a nephews wedding , bagpipes and all, it was magic. It would be my own wedding. We were very young and got married by a Justice of the Peace in his home. He didn't turn off the TV so we were married to Gunsmoke! I don't know that I've attended a wedding that was memorable. The most special one would be mine. I wore an old-fashioned Jessica McClintock's style gown that was marked down in a dress shop and was married in a Victorian Episcopal church. I would say that I haven’t attended a memorable wedding but I loved watching Harry and Meghan! The most memorable wedding for me would be my own wedding. It was a beautiful fall day (with no wind, which is unheard of where I live). We were surrounded by people we love and had a beautiful ceremony in a small church, followed by a reception that gave us the opportunity to visit with people that made the trip to wish us well. Riding off into the future in a Jeep with my veil flowing behind us was the best way to end the day!